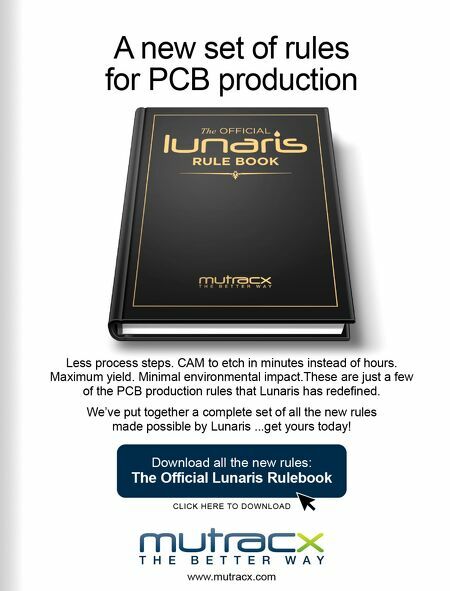 54 PCB007 MAGAZINE I JUNE 2018 At the recent CPCA Show 2018 in Shanghai, Jochen Zeller, vice president of AWP Group, sat for an interview to discuss the challenges impacting wet processing, such as the continuing miniaturization trend leading to finer widths and line spacings. Zeller also explains his perspec - tive on the need for integrated, automated lines in a facto- ry, and how this benefits PCB manufacturers. Other topics include A WP Group's part in Whelen's engineering project, the technology they provided, the challenges encountered, and how they were able to help address those issues. RTW CPCA Show: AWP Discusses Whelen Engineering Project Success References 1. Clyde F. Coombs Jr., Printed Circuit Hand- book, Sixth Edition, McGraw-Hill, New York, 2008. 2. Mordechay Schlesinger, Milan Paunovic., Modern Electroplating, Fifth edition, John Wi- ley & Sons, Inc., Hoboken, New Jersey, 2010. 3. W.P. Dow, M.Y. Yen, W.B. Lin, S.W. Ho, "Influence of Molecular Weight of Polyethyl- ene Glycol on Microvia Filling by Copper Elec- troplating," Journal of The Electrochemical So- ciety, 152 (11) C769-C775 (2005). 4. W.P. Dow, C.W. Liu, "Evaluating the Fill- ing Performance of a Copper Plating Formula Using a Simple Galvanostat Method," Journal of The Electrochemical Society, 153 (3) C190- C194 (2006). 5. P. Broekman, A. Fluegel, C. Emnet, M. Ar- nold, C. Roeger-Goepfert, A. Wagner, N.T.M. Hai, D. Mayer, "Classification of Suppressor Additives Based on Synergistic and Antago- nistic Ensemble Effects," Electrochimica Acta, Volume 56, Issue 13, 1 May 2011, pages 4724- 4734. 6. K. B. Herbert; S. Adhikari; J. E. Houser, Journal of the Electrochemical Society, 152 (5) C324-C329, 2005. 7. S. Dharmarathna et. 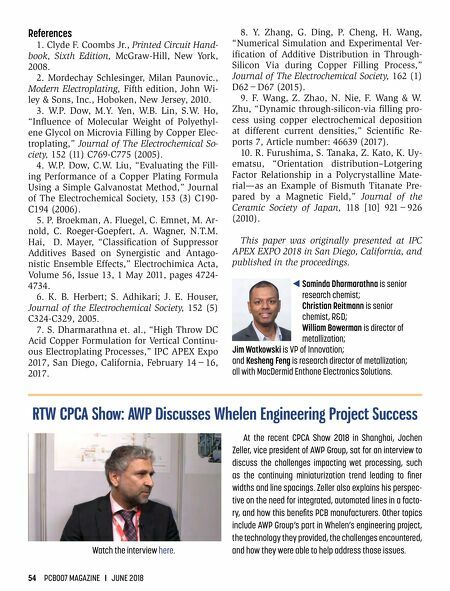 al., "High Throw DC Acid Copper Formulation for Vertical Continu- ous Electroplating Processes," IPC APEX Expo 2017, San Diego, California, February 14−16, 2017. 8. Y. Zhang, G. Ding, P. Cheng, H. Wang, "Numerical Simulation and Experimental Ver- ification of Additive Distribution in Through- Silicon Via during Copper Filling Process," Journal of The Electrochemical Society, 162 (1) D62−D67 (2015). 9. F. Wang, Z. Zhao, N. Nie, F. Wang & W. Zhu, "Dynamic through-silicon-via filling pro- cess using copper electrochemical deposition at different current densities," Scientific Re- ports 7, Article number: 46639 (2017). 10. R. Furushima, S. Tanaka, Z. Kato, K. Uy- ematsu, "Orientation distribution–Lotgering Factor Relationship in a Polycrystalline Mate- rial—as an Example of Bismuth Titanate Pre- pared by a Magnetic Field," Journal of the Ceramic Society of Japan, 118  921−926 (2010). This paper was originally presented at IPC APEX EXPO 2018 in San Diego, California, and published in the proceedings. Saminda Dharmarathna is senior research chemist; Christian Reitmann is senior chemist, R&D; William Bowerman is director of metallization; Jim Watkowski is VP of Innovation; and Kesheng Feng is research director of metallization; all with MacDermid Enthone Electronics Solutions. E Watch the interview here.